Alien investigator, Sarah Jane Smith, is back on CBBC with a fourth series of The Sarah Jane Adventures from Monday 11 October. Created by Russell T Davies, the hugely successful Doctor Who spin-off sees Sarah Jane and her teenage gang set off on brand new adventures that take them out into space and back in time to face Nazi soldiers, a Victorian ghost-hunter, and turmoil in the Tower of London. From their secret attic in Ealing the gang battle enemies old and new, including Androvax the veil, deadly androids, relentless robots and undertaker vultures. Luke confronts his worst dreams when he meets the Nightmare Man; Rani and Clyde wake up to find they are the only humans left on Earth; and in a very special episode, Sarah Jane joins forces with the Doctor’s former companion Jo Grant to uncover an interstellar conspiracy that threatens the life of the Doctor himself. 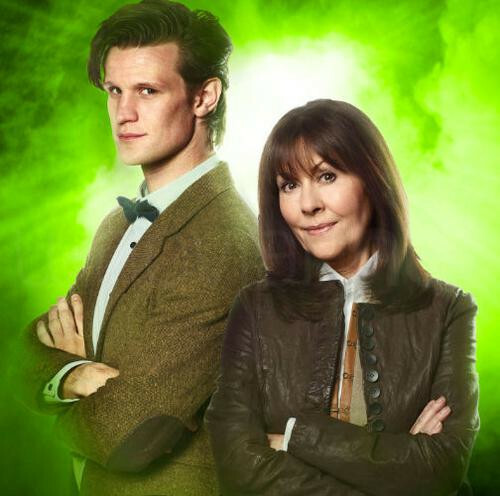 Elisabeth Sladen returns as intrepid investigative journalist Sarah Jane Smith alongside young stars Tommy Knight as Luke, Daniel Anthony as Clyde and Anjli Mohindra as Rani. Luke faces life-changing events, and Bannerman Road will never be the same again. But when Sarah Jane’s son has his first nightmare, he’s haunted by a dark figure from his dreams. A strange entity is reaching out to our world, with terrible consequences for the whole human race. With Luke, Clyde and Rani trapped in a bizarre dreamscape, Sarah Jane must fight alone! As the Nightmare Man grows stronger, only K-9 might hold the key. But can Luke summon the courage to face his adult life before the whole world is trapped in an endless nightmare? When an old enemy, Androvax the Veil, returns to Earth, the gang face a dilemma – should they trust him? Or does the legendary Vault hold an even greater terror? But a second threat arises, when android guardians threaten to destroy anyone who uncovers their secrets. As the battle between Sarah Jane, Androvax and the androids reaches its climax, Rani has to save her own mother from being caught in the crossfire. But as the Vault opens the destiny of the entire Veil species is at stake. Is it too late to save them? When the Doctor is declared dead, old companions Sarah Jane and Jo Grant meet for the very first time, and join forces to discover the truth. As an interstellar conspiracy gathers around UNIT HQ, Clyde finds that he holds the fate of the Time Lord in his hand – quite literally! Old friends fight together to make one last stand against the sinister Shansheeth. But with Clyde and Rani trapped in terrible danger, Sarah Jane and Jo Grant realise their worst fears – their friendship with the Doctor might be the very thing that dooms them. Clyde and Rani wake up one day to discover that they are the only survivors of the human race! The whole of Earth is empty – even Sarah Jane has vanished. But a deserted London holds terrors of its own. Strange forces lurk in the shadows, as mysterious visitors approach! Clyde and Rani meet their enemy, as the Robots arrive on Earth – but what do they want, and where has the human race gone? It’s a race against time, but without Sarah Jane’s expertise, Clyde and Rani must trust each other like never before if they’re to save the whole world. A harmless investigation turns into an epic quest across time and space. Sarah Jane and the gang are separated by the enigmatic Shopkeeper, and find themselves in three different time-zones throughout history – doing battle against ghost hunters, Nazis, Tudors and a mysterious parrot called Captain! While Sarah Jane tries to prevent a future tragedy, Clyde has to take on the Third Reich single-handed! But Rani discovers to her horror that the march of history cannot be stopped, as a greater danger from the Time Vortex threatens to consume them all. Sarah Jane faces her saddest day, as she realises that no one can defend the Earth forever. She’s saved the world so many times, but must now hand over the task to safer hands. Clyde and Rani are distraught, and the forces of darkness gather as the inevitable day approaches. Sarah Jane has gone – but a new regime begins at Bannerman Road! Clyde and Rani must face the fact that nothing lasts forever – but can they still unite as a team, to face a new and deadly threat from outer space? Or is the old gang finished for good? 1. Doctors 1, 2, 3, 4, 10 and 11 all make an appearance. 2. There's mentions of Axons, Azal and Aggedor. 3. "Smells like roast chicken!" 4. The Brigadier is still stranded in Peru, while Liz Shaw is on the Moon. 5. That's Groske, not Graske. 6. The Doctor doesn't have to be white. And he can regenerate more than 12 times - a lot more! 7. "You look like someone's baked you!" 8. Jo Jones (née Grant) has 7 children and (almost) 13 grandchildren. 9. The Doctor might never look back, but Sarah Jane has discovered some interesting things using Google. I just wish more than me and you watched it.